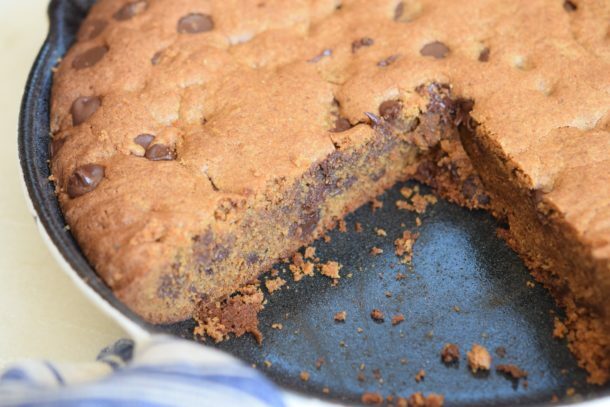 Let me warn you in advance that this skillet cookie has “dangerous” written all over it. Yes, it contains whole wheat flour (or whatever GF flour blend you want, for that matter.) Sure it’s dairy-free. No refined sugar, either. But I taught this recipe at least 20 times during the month of February and into March and I could never resist a piece after each class. Moreover, the scene was always the same every time: normally composed and refined women, instead inhaling and quite frankly moaning while breaking off hunks of this oversized cookie standing over the skillet. So why am I sharing such a recipe? Because Mother’s Day is coming up, as is Memorial Day, and there is no better time to make a gigantic cookie than when you are feeding a crowd. The strategy is such that everyone will demolish this deliciousness and leave you with no leftovers. 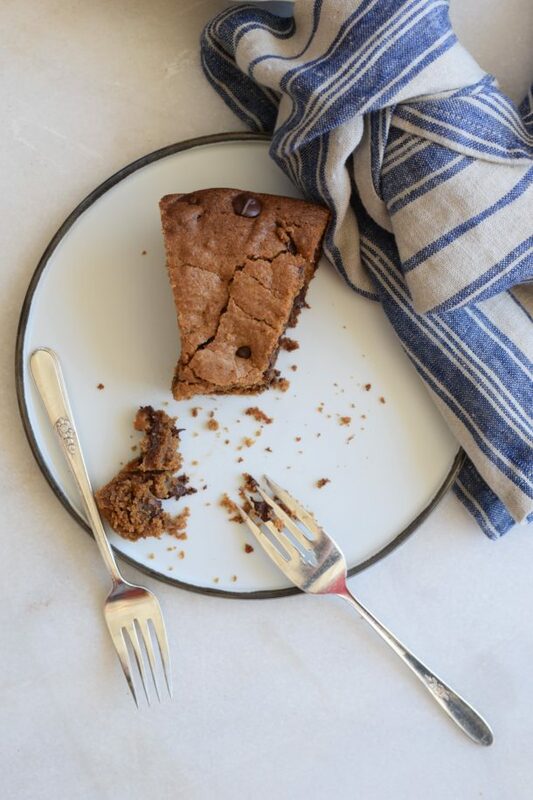 Believe me, no one can be trusted to be alone with skillet cookie leftovers. I mean, everyone likes chocolate chip cookies. So logic would follow that since one slice of this is like 6 chocolate chip cookies stacked on top of each other into one dense, chocolate-studded treat, it is impossible not to love. And if you serve this warm — forget about it! 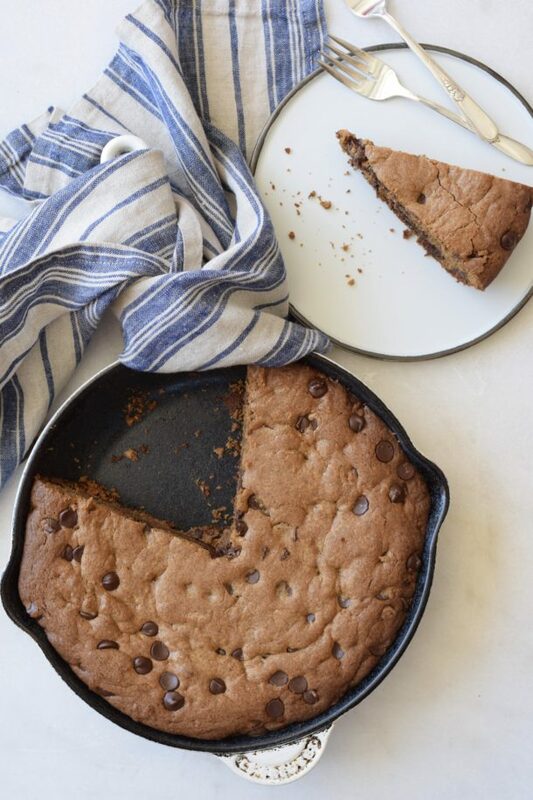 I made at least 50 of these skillet cookies over the last few months — with whole wheat flour and with gluten-free flours, with avocado oil, olive oil, and coconut oil, in a cast-iron skillet and in a pie plate, with all types of chocolate chips and chocolate chunks. 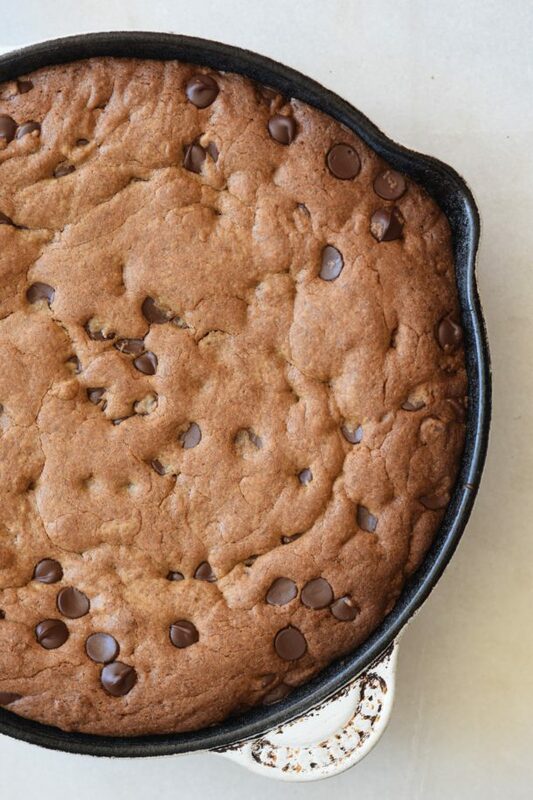 For me, the winning combo was any flour, avocado oil, in a cast iron skillet with extra-large dark chocolate chunks. For some reason, this cake with avocado oil tasted like a graham cracker and therefore the whole thing tasted like a big s’more. Not a bad thing, mind you. Coconut oil left a slight coconut flavor (which I found most pleasing) and olive oil imparted an olive oil flavor only if the cake was warm. Where’s the nutrition info? We’re skipping that lesson today, folks. This is not “good” for you, merely less bad for you than a standard chocolate chip cookie batter. But it might just be one of the best things I have ever eaten! If you make it, have a reasonable slice and enjoy it. Don’t feel guilty about it. That defeats the purpose. You can have your cake and eat it, too. But you just have to share. Click here to watch my Youtube video! In a medium bowl whisk together the flours, baking powder, baking soda and sea salt. Slowly add to the oil/sugar mixture and blend until everything is combined. Spread the mixture into the prepared skillet and bake until golden brown, about 30-40 minutes. (33 minutes is perfect in my oven.) The edges should be dry and the center should be somewhat soft, but it will settle once it cools. You want it to be just slightly underdone. If you are not eating the cake in the next hour or you will wait until it is completely cooled, you definitely want to undercook it. Allow it to cool at least 20 minutes so that it will slice properly. If you want to eat it right away, it may not slice well. THIS IS AMAZING! I used Spelt flour. My table of sugar loving dairy eating guests absolutely freaked out. Terrific recipe. Can’t wait to make for the kids! Oh good! Such a fun recipe to share, isn’t it? Enjoy! Hi Pamela, I wanted to ask if this could be made a day in advance of serving? If so, how would you recommend storing and reheating it? Yes. Be sure to not overbake it though. Cover it and store it at room temp. If you want it to be warm, reheat at 300 degrees for about 10 minutes. Has anyone tried this with almond flour instead of whole wheat flour? I haven’t, but I bet you could sub half almond flour and not have to change anything else. More than that, you would need to make some adjustments. Yes, this was most delicious! I made it yesterday and took it with me to see my uncle and cousins who are visiting from Michigan. Everyone loved it. I used the Enjoy Life chocolate chunks and they were perfect. We may have added a scoop of ice cream which made it extra good. 🙂 I am not the best baker but I think I cooked it like you described in your blog post. It was a nice treat. Thank you as always. Would melted butter work as a replacement for the oil in this or would the long time in the oven cause it to get too brown? Hi! Sorry for the delay in my response. I have never tried the recipe with butter, so I would not have been able to advise one way or another. I am so excited to hear it worked well for you! Did you melt the butter or cream it with the sugar? Thanks! I really tried to resist makimg this, but broke down after a few days. It was INSANELY good of course….a massive hit, thank you! Counting down the days until your cookbooks arrive that are on order! Random question, do you trust bottled water? Or do you use a filter? I wonder if the plastic bottles defeat the purpose and wondering if I should use a water filter like Zero or something you recommend? Thanks and Happy Mothers Day!! SO glad you enjoyed the cookie cake! It’s decadent, but a little goes a long way. I do not drink bottled water. Plastic leaches and if I can avoid it, I will. We have a home filtration system from Life Source. I am not familiar with Zero, but that doesn’t mean it’s not a good system. Happy Mother’s Day! Can flax eggs be used as an egg replacement in this? I haven’t tried it, so I can’t be sure. But I think it should work fine. Please report back if you try it. I made this last night for my family (I was out to dinner) and when I got home my husband raved about how good it was – of course he had his with ice cream. My daughter told me this morning how much she liked it too. I used avocado oil and coconut sugar, added some cinnamon and maldon salt to the top before baking. And since I baked it during my two year old’s nap I took the suggestion of underbaking it (28 minutes). I just had my first piece after lunch today and aaaahhhh … so good!! Love the feedback! Thank you, Joan! What is pastry flour? Can you use regular whole wheat flour? Whole wheat pastry flour is a type of whole wheat flour that is lighter and finer than traditional whole wheat flour. I haven’t tried regular whole wheat flour in this recipe so I am not sure how it would come out. If you try it, let me know! I think there’s a measurement missing for the GF flour. Can you use a regular spelt or whole wheat flour if you don’t need to make it GF? Yes, thank you! Somehow the entire line with the flour measurement was deleted. Fixed! I was reading through the recipe and I think the information regarding the flour is missing. Good eye! Fixed, thank you!